It’s been cloudy again. The days of sun really spoiled me. I finally got back to my secret little beach (not really a secret, but certainly less crowded than the local state park) and got my feet wet. But now, looking outside, it’s just gray. When I left work last night, it was dark. It’s so easy to take the summer days for granted, when it stays light out until almost 10pm. I close again tonight, so I had all morning and have a nice chunk of the afternoon before I have to be in to work. For the past few weeks, days like these saw me staring at a computer screen, watching Netflix or glued to Pinterest. Last week I mostly had my nose in a book. 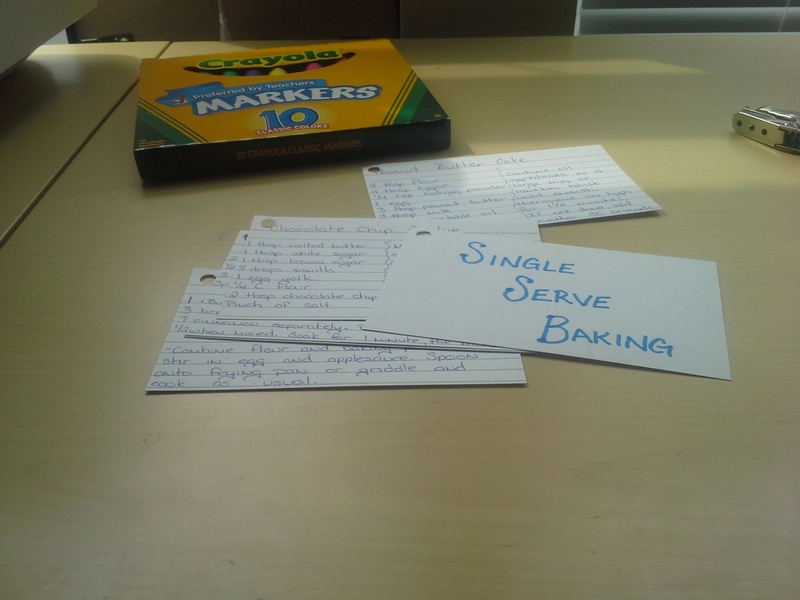 In speaking to my counterpart yesterday, I mentioned my recent obsession with single-serve baking. He was quite intrigued, being a bachelor himself, and he asked me to share some of the recipes. I guess printing them seemed too easy, so instead, I wrote the recipes on note cards, hole-punched those suckers in the corner, made a little cover, and strung them together with a ring. I guess in all of this trying to figure out who I am this seemed a fitting answer. I’m the kind of person that can’t just write down recipes. I need to make it something else entirely because sharing recipes is like sharing food, and sharing food is special. Another piece of the puzzle that is I. If you’ve been kind enough to keep reading my blog, you’re probably thinking “where are the crafts?” I am here to answer that question. Maybe you’ve heard – or even told someone – that there is a difference between an excuse and a reason. The truth is that a reason is just a socially accepted excuse. The more people do amazing things and overcome dire circumstances, the fewer reasons we have and, conversely, the more excuses. All of this is to say is that I hope my excuses can, at least in this gallery, be socially acceptable. When I first moved here, I was in desperate need of decompressing from the classroom. I was a terrible teacher – a great mentor and support for my kids – but a terrible teacher. I am not used to sucking so bad at things, and Arkansas was just such a miserable place, so I sought some time away from things. I rediscovered my love of making things then. 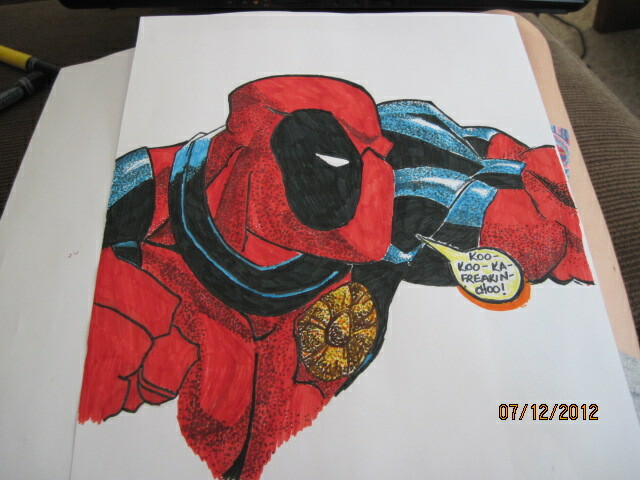 I was so excited to have free time, and I had so much pent up creativity that I dove into sewing and drawing and painting. It was a great time. But I am not good at staying inside, and I have had a job of some kind since I was 14. It was only a few months before I started buckling down and looking for jobs again. For various reasons, I ended up taking a part time job in retail. I worked shifts starting at 5am, so when I got home, I was exhausted, and my bed time was 8pm most nights. Even though I had time to spare, I was always tired. I worked with craft supplies all day, though, so I was often inspired, and I found ways to fit things in. I also had every weekend off, and that made the summer months flexible. Wanting a little less early morning and little more cash flow, I took a full time job – still in retail. I started during the holiday season, and while I had previously pledged to create all manner of Christmas gifts, I was suddenly working 40 or more hours per week and at fluctuating times. Some weeks I closed 3 nights, others I opened. I had forgotten how hectic a retail schedule can be and how hard it is to juggle life with consumerism. And now…now I’m just worn down. I have always tended to be anti-consumerism, and yet here I am feeding it. I am still tired, but for different reasons, and most days, I come home, cook dinner, squeeze in what time I can with Eric, and then go to bed. I work most weekends, so my evenings (or mornings) are now precious commodities for laundry, dishes, or reading a book. I am apathetic at best and nihilistic at worst lately, and my creativity is suffering for it. Even on days when I feel the spark, I go to my craft desk, and I end up staring at it for what seems like eternity. The only place I haven’t lost my drive is in the kitchen. I feel like that’s cheating though. I can’t very well be a polymath if I’m only ever cooking. So consider this my reason for not bringing out the big guns. I hope that, once I start school (which seems like a far-away dream), I’ll be able to introduce a new type of craft through engineering. We’ll see. I should have known when I woke up to Eric’s alarm at 6:30 this morning, an hour and a half after I was supposed to be at work, that it was Thursday the 12th. Most people are more familiar with this dreaded day’s lesser cousin, Friday the 13th, but I can tell you, sitting here with a splitting headache, that Thursday the 12th is the one you have to look out for. My day started bad yesterday, when I got home from dinner with my mother-in-law and her boyfriend and went straight to bed. I was exhausted. I was so exhausted making sure I had my alarm set slipped my mind. Thus my waking with Eric’s alarm 2 and a half hours after mine usually goes off. I called the store, and they were nice about it, but I had already let myself down. I practically flew out of the house, forgetting my coffee, and laying the foundation for this current headache. We share a parking lot with a church, IE we have to pull into their lot to get to our driveway. As I’m running out to the garage, I notice that the church has blocked off the entrances/exits to the parking lot. This made me livid; they complained to our leasing agency once because the yard was a little crazy after four days of rain – on the first sunny day, when we could have mowed in the first place! And then they make it a struggle to get out of our own house?! Once at work, things were fairly straightforward, and for the most part, it was fine. My managers had a sense of humor about my being late, and I offered to stay for my full shift hours, so that I could help ensure the truck was unloaded. I spent the first two hours with a load of boxes that I unpacked and stocked. Then I moved onto restocking some of the wedding stuff, only to find that the planograms that my associate set yesterday were backwards. That means we get to redo them next week. At noon, I clocked out, made a few more self-deprecating jokes, and went on my not-so-merry way. I had had no caffeine, so my head had already started to pulse; I didn’t pack much to eat, so I was pretty hungry. I got home and found no coffee in the pot. Since we’re going up North (again) this weekend, we don’t have much in the house food-wise except what we have for dinner tonight. I decided that I deserved to have food delivered to me, so I looked up the number for Jet’s Pizza and called. But it was apparently the wrong one because they said they didn’t deliver here. They were nice enough to give me the number for the other Jet’s that does deliver, but at the time, the only thing in my mind was “are you kidding? I can’t even order a pizza right today”. I wallowed in self-pity for about two minutes before calling the one closer and ordering. The pizza was good. I had some soda, too, but it was too little too late. These are the horrors of Thursday the 12th – the little things that stack up to make your day a grinding pain. The worst thing is that I failed myself. Sure my managers understood my being late, and they weren’t terribly angry, but I failed to maintain my own expectations. Almost all done! 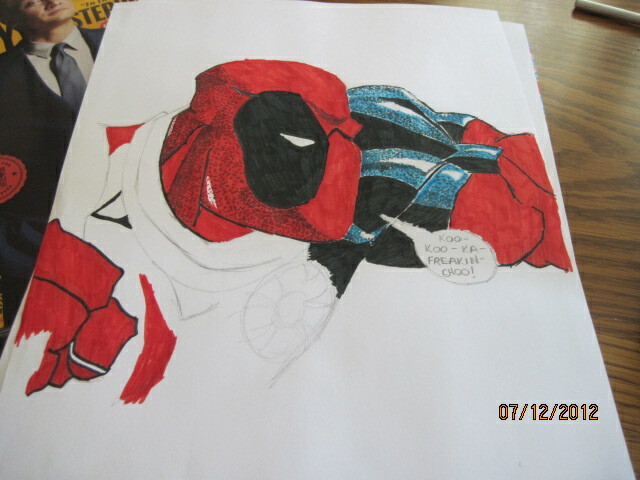 Only details left. 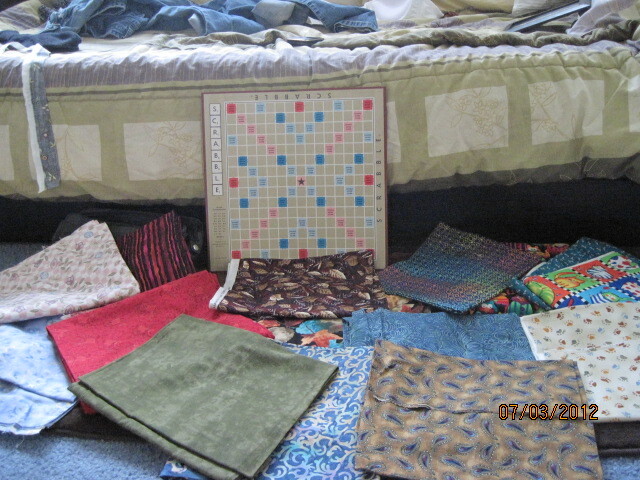 As (I hope) I mentioned, this weekend I came home with a nice new array of fabrics, as well as an old Scrabble board that I will find a use for. I am not entirely sure which game board craft to do with the board, but I thought it could be useful, regardless. 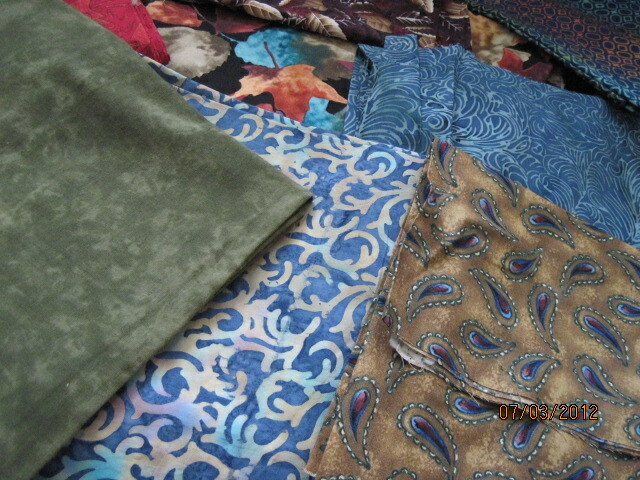 As for the fabric, I have a little bit for practice, a little bit for clothes/clothing embellishments, and a whole lot for decorative projects. Remember my mess of a craft room? I didn’t clean it that day, like I said I would, but with the new fabric, I did spend the morning (before it got hot upstairs) organizing and straightening, so it was a good motivator. 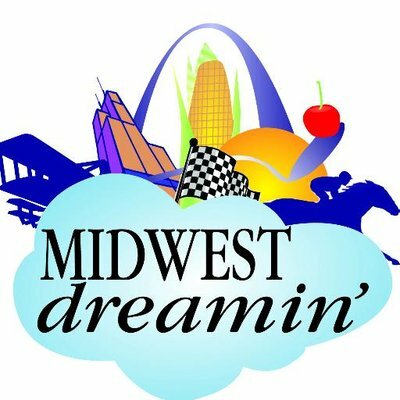 It occurred to me that it is 4th of July week, so I decided not to venture out to Field’s this week. I can drop off my machine next week, and in the meantime, I can work on planning/cutting/etc. Once my machine is sufficiently cleaned and primped, I will go about sewing all of the seams together and maybe even, eventually, fixing the hem on that skirt. As far as my first day yesterday, it was about what one might expect on a first day. I filled out a lot of paperwork; I watched videos about customer service and safety (the safety videos made me a little sad; I miss being the safety guru). I also made a fabulous first impression by “losing” my keys at the end of the day. Read: I just switched to a new purse, and I put my keys in a pocket that I forgot was there, thus spent a goof fifteen minutes scouring my car and the store for them. The manager just laughed it off, so I hope I didn’t set myself up as that person. I work again on Thursday, and I will start doing my actual job training then, I think. I’m working “replenishment”, which means I’m basically a stock gal, but I’ll also be doing Planograms, a la my time at Target in Seattle. I enjoyed Presentation, so this should be a breeze. Say what?! 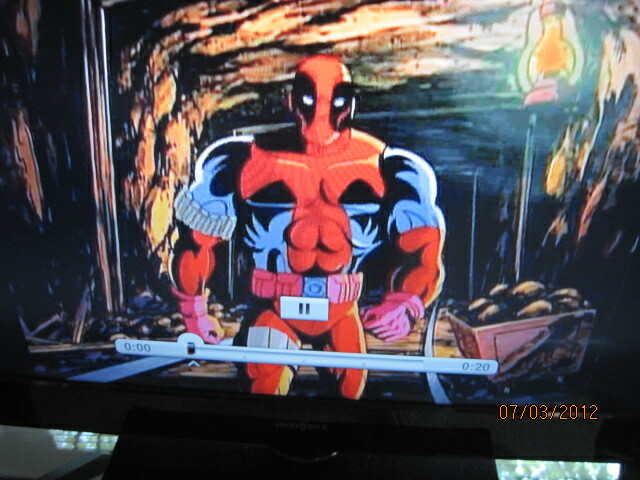 Yes, that is Deadpool in the 90’s run of X-Men! Well, not really. 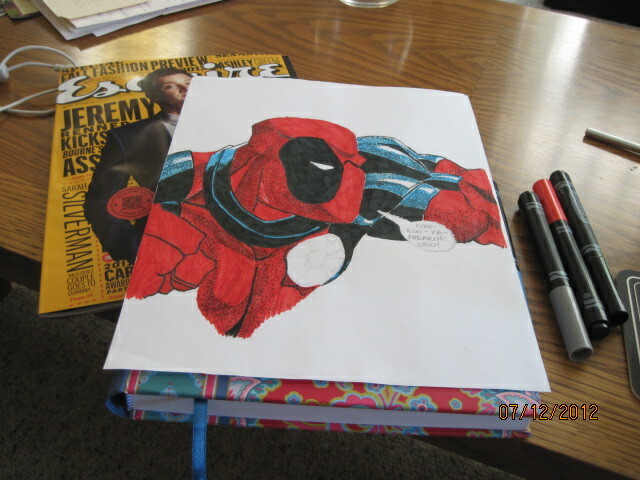 It’s Morph taking the shape of Deadpool, but as I was bored, flipping through an old journal and watching X-Men, there he was. I squealed, had to rewind the scene, and take a picture.